This is my reality. I am not an emotionally empathetic kind of person and that probably doesn't come as a big surprise to anybody. Least of all me. The fact that I then misread people and don't realize (for years) how badly I've judged a situation and contributed to an unprofessional environment is not good. This week people in our community confronted me about my lifetime of not understanding emotions. My flippant attacks in emails have been both unprofessional and uncalled for. Especially at times when I made it personal. In my quest for a better patch, this made sense to me. I know now this was not OK and I am truly sorry. The above is basically a long-winded way to get to the somewhat painful personal admission that hey, I need to change some of my behavior, and I want to apologize to the people that my personal behavior hurt and possibly drove away from kernel development entirely. 185 upgraded, 8 newly installed, 5 to remove and 0 not upgraded. More Actions → No Border. 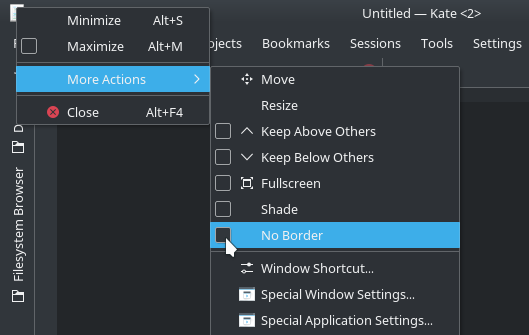 If only the world would be as easy and customizable as KDE. I am so used to klipper saving me that without it half of my ideas and writing would get lost again. It feels nice to use the original.